There are some people who believe their success and achievements are simply down to hard work, perseverance and self-determination. Sam Gyimah has a different school of thought, saying his journey up the ladder of business and now politics could not have been possible without someone lending a helping hand. 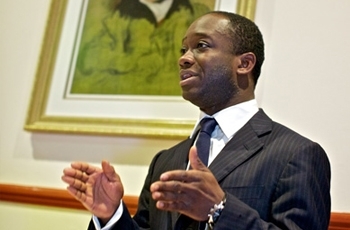 Gyimah was elected as a Member of Parliament for East Surrey at the 2010 general election but is determined to do unto others what others have done unto him. That is perhaps why the Conservative MP decided to put himself forward for OBV Parliamentary Shadowing Scheme, which enables individuals from the BME community an opportunity to shadow an MP as they carry out their parliamentary and constituency duties. "There are a lot of politicians who use phrases like 'I pulled myself up by my own bootstraps and I made it by myself'. I can tell you from my own life, every success I have had is because somewhere down the road you've met someone who is willing to pull you up and give you a leg up - whether it was a reference, advice or actively supporting you - somewhere down the road that's what's made a difference to my life." Gyimah gave credit to his history teacher at school who helped him prepare for his entrance exam to get into Oxford University. "He gave me a lot of his time, after school, working through exam papers with me and that's how I got in. And that same pattern has followed me throughout my life, in terms of getting my first job, in business and eventually getting elected, and that's why personally, I am delighted to be involved in (the shadowing scheme) and help in any way I can." Gyimah believes that the scheme will help the shadows learn about the rules to help them understand how Parliament works and operates. "In anything in life, if you don't know the rules of the game, no matter how determined you are, it’s difficult to break through." "Speak to anyone in Parliament and no matter what their experience, it's all about perseverance. Politics is a tough game, you get lots of knockbacks, a lot of people saying it's not possible - I would encourage all in the scheme to not think of it as the end, see it as the beginning of your quest of whatever you want to do in politics and make something in your experience."